It's very interesting to me that my friend Jim just published a synchronicity tale involving a semi-precious gemstone necklace -- because I have a similar story to tell today (well, at least similar in that it's centered around what I personally view as a powerful synchronicity involving a necklace containing a special stone). A warning: This post will be at least as "out there" as any other I've posted here -- perhaps much more. S ee what you make of this, Jim! I did generally appreciate the gesture, of course. But, I nevertheless put it into a jewelry box where it sat dormant for years. Now, I've posted numerous tales of spiritual awakening here. One critical detail I seem to have left out of all of these stories was the role of this necklace. While this is something I'd personally noted quite some time ago, I never wrote about it, as it never struck me as anything more than moderately eyebrow-raising. But, things took a step into the realm of full-on synchronicity this past weekend. You see, back when I had what I now refer to as my "awakening" (September 18, 2008), I did something extremely inexplicable the next day (September 19, 2008). For some then unknown-to-me reason, I matter-of-factly walked to the jewelry box sitting on my dresser and dug out the above necklace. Wendi happened to have a silver chain in her possession that fit it (and me) perfectly, and I simply put it on. Looking back, this is without a doubt one of the more unusual details of all of the mystical stories I've told on these pages over the past year. There is no rational reason that exists for this action. None whatsoever. I don't even know how I might have remembered that it was even in the jewelry box in the first place! ... It's exactly as though I was called to do something on a very deep, sub-conscious level, and then I did it as though it was the most natural thing in the world to do (when, just a day before, the act of donning this necklace *never* could have occurred). This is an eerily spot-on description, given the experiences of the past year. I didn't really know much about the stone at first. When I first put the necklace on, I just kind of intuitively knew that I should wear it, not questioning it at all. But, a little later when I read some things about Moldavite, I did begin to regard it as even more meaningful, and I often held the locket in my hands as I searched for guidance on issues I'd been working through. More than occasionally, I would go to sleep grasping the locket, or hold onto it for a while before meditating (sometimes during meditation). So, there we were on Saturday afternoon, gathered with friends, eating delicious, nutritious foods, chatting, hula-hooping on the lawn by the gazebo ... when my friend Rawbin said to me, "Hey Jim, wasn't there a stone in your locket." I nodded and said, "Yeah, it's Moldavite." But then she said, "I know, but it's gone now. The locket is open." ... except the cosmic, spiritual-awakening stone from outer space was gone! Turns out the whole time it was just a very simple snapping clasp that held it shut. I could have opened it at any time -- could have made actual, physical contact with the Moldavite -- but never did. At first, I was rather bummed out to have lost something so special. But, as people began to comb the surrounding grass, Wendi said, "When did you first put that necklace on?" It was at that moment when I stopped looking for it, even though I let the others continue their search. I realized then that it had been exactly one year to the day since I attached that stone to my person full-time, perhaps even one year to the hour, for all I knew. Somewhat saddened by its loss, I surmised that the Moldavite's departure constituted an act of consciousness. In fact, I just "know" this somehow -- even though I realize that such a statement probably sounds pretty far-out to a lot of people. It's mission complete, the stone left me. That's the bottom line here. 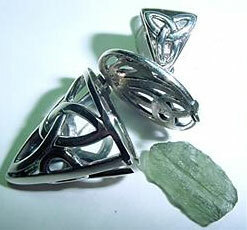 I miss the Moldavite, feel its absence. I wish I'd known about the locket being openable all along, wish I'd had a chance to make physical contact with that powerful energy. Does it strike anyone else as peculiar that I "owned" a stone for exactly one year, wore it on my person at all times, yet never touched it -- when I easily could have at any time by simply opening a locket that I never knew opened?! Thoughts crossed my mind of simply replacing it -- dial one up on eBay or something. But, I know enough now to know that this isn't how it ideally works. Whether it's a crystal or an animal totem or any metaphysical symbol, I think it has to happen to you; you can't (or, really, shouldn't) force it. Yes, there is a time for proactivity in life, and such willful volition is certainly commendable and useful, but there's also much meaning in what happens to us, what crosses our path, what we're called to, what we're called by. It's great to tune into that, as all of these things are another consciousness from which we can learn and elevate. So, I guess I'll just hang with the pits for a while, until some other mystic crystal revelation occurs. Yesterday, I swung down to Bellevue to pick up some 300 lb. petrified wood tables for delivery. While there, I noticed they also had some even larger jasper stone tables that probably weighed somewhere between 700 and 900 pounds. I don’t know if at any time in my life, if these were stones I would want to touch. Perhaps the gem was too precious for you to touch, as it lay dormant, and even as you donned it for a year. If you had touched it, it might have shocked you. Wendi discovered the pendulum at a Fairy Festival. It’s said that fairies dance in circles to enter new-enchanted realms. You danced in a full circle, revolving around the sun a full year, while donning the untouched gem. The pendulum swung the gemstone back into earth after a full year. I don’t know what the silver could signify, though perhaps another blog reader can awaken us on that. Jim B sent us here! Great story. I just bought some moldavite earrings and now plan to touch them a lot more!! I'm a Blue Eagle - I define in order to create! Thanks for this story BSUWG - I'm glad you are happy in your new spirituality and way of eating.